Nerd Lunch Crashed Our Geek Lunch! At some point in college, it’s expected you’ll crash at least one stranger’s kegger. However, as an adult crashing a fellow geek’s lunch is a whole other matter! If you’re unable to view the embedded video above, please click here. All kidding aside, my thanks to the folks at NerdLunch.net for inviting us on their show. CT, Savannah, and Scott were great! They did such a fantastic job with the camera work and editing! I absolutely loved Vanessa and Erika’s expressions! Priceless! 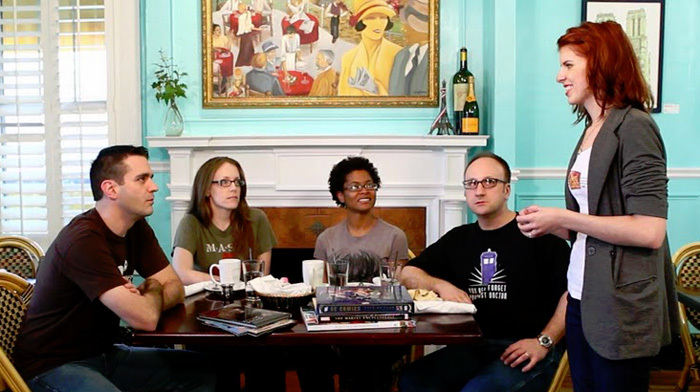 Be sure to check out previous episodes of Nerd Lunch: The Web Series! Also, you can follow them on Twitter by clicking here. If nothing else, this video proves that I’ve got a face for radio. Saw this last night. Erika, Vanessa and yourself did a good job. I enjoyed your segment of the episode. What is funny, though, in the first picture you posted above, you look like you are about to tear that lady a new one. You have a bit of an annoyed look on your face directed at her. Excellent idea, Frank. Unfortunately, it would be labeled as “idea theft”. But I think they should do it anyway. Thanks for posting the video, Shag! We’re glad you and the girls from Girls-Gone-Geek could join us. Maybe we can work on a project together again someday. @Ed – I think that look was after she asked if CT was bothering us. I was looking annoyed and nodding my head in affirmative. @CT – Thanks for having us! It was a great opportunity and fun to hang out with you, even if you did crash our lunch. NERD! @Frank – I could watch Erika and Vanessa all day long. But myself? Nah, I’ve got a face for radio. Maybe I could do their voice-over work.